When I lived in Boston I wanted to play music on the subway platforms. I frequently saw some really good musicians playing there. I put together a set list and practiced it as if I was there and imagined the people walking by trying to ignore me. In the end I think I was lacking the ego required to pull something like that off. Maybe if I was out of work and needed the money things would have been different. Our jazz group tried to do one of those side-show kind of things. Apparently the city of Seattle requires that you have a permit to perform music for tips. Dang, Mr toast beat me to it. Though I have to wonder what that sounded like. Knowing Biff, it could be anything. You know, I’d tip him better. Any man who goes to the effort to get a fish like that and play it in the subway deserves some money. I was going to suggest another theme, but it sounded too fishy. I think Biff is playing the wrong kind of bass. So many bad puns I think I puked a little. I suppose playing a fish in the morning might be OK but I’m guessing that by mid-afternoon you’d have to chuck money at Biff from at least 10 yards to avoid the gut wrenching smell. i think you would have done okay. I’d give him a seriously big tip if I find him in the subway. So he plays the bass? I remember the tuna fish from the one with the tuna flavoured sunblock. Also, the Halloween Biff avatar is itsy! All the good jokes are taken, so I’ll be pedantic: Biff can’t be playing bass; that’s clearly a tuna. I just realized, every single person/first-timer who read TBOF archives has said, “I just read the archives from beginning to end! Great stuff! Looking forward to more!” or something of the like. That says something about your stuff, Chris. *Sings* Fish heads, fish heads, rolly polly fish heads! Fish heads! Fish heads! Eat them up, YUM! heh Biff is playing a fish. I’d tip him too. @ Masked Man / Kurast: Bdddrump, Pshhhh! 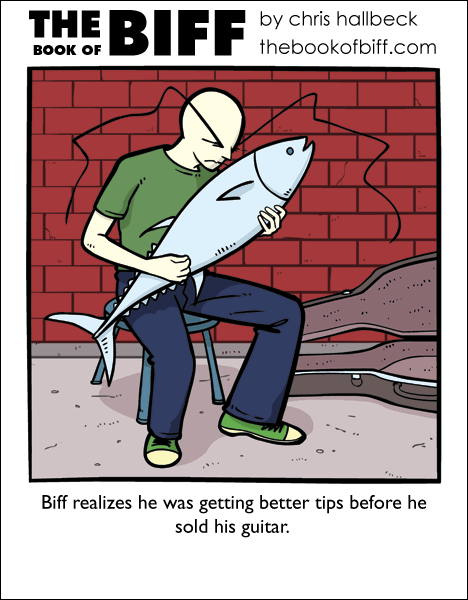 I’d compliment Biff on his musical skills, but I know he’s just fishing for compliments. And unfortunately, all you can play on an instrument like that is scales. Man, I’m on a roll here. …A salmon roll. I just needed a Biff Alternate for the first time in a while. Biff’s outlines look thicker than usual. Just noticed. Does Biff play for scale? @ Jackson: That was actually very original, I laughed harder than than with the comic! Great job, you earn 10 points for not using a dumb overused pun! Now I’ll use a pun: Biff must be playing to earn Gil (Any Final Fantasy fan will know what I mean). @Amy-I took a fish head out to see a movie. Didn’t have to pay to get it in. As a sidenote, I name the new species of fish ‘Thannus sonorous’. I had that exact same joke running around in my head for the longest time, but I could never figure out how to present it. You beat me to it. Yay! You finally made my idea from last year come true that Biff should play the bass! I’m surprised no one has made the obvious Majora’s Mask comment yet. It’s obvious Biff is trying to be the guitar-playing Zora dude you watch die on the beach. Zelda fans, are you out there? And I happen to be a bass player, I got a really good kick out of this one. Hehehe, he is a bass player. That reminds me of the Zora instrument from The Ledgend of Zelda: Majoras Mask. This picture suddenly reminds me of the Zora instrument. Does that mean that Biff was reincarnated from Zoras? That’d explain his ability to breath underwater. Where will you be when the bass drops?